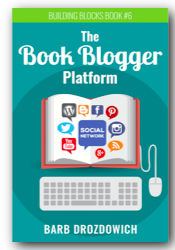 Welcome to Sugarbeat’s Books – The Home of the Romance Novel! Welcome also to Series Sundays. 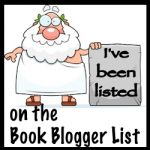 This is the day that I get to celebrate my most favorite thing – books written in series! Last week we started the latest series being written by Sarah MacLean. Today is book two! Sit back and enjoy. Although I always say I love books in series, the characters in this book are outstanding! Since being named “London’s Lord to Land” by a popular ladies’ magazine, Nicholas St, John has been relentlessly pursued by every matrimony-minded female in the ton. So when an opportunity to escape fashionable society presents itself, he eagerly jumps – only to land in the path of the most determined, damnably delicious woman he’s ever met! The daughter of a titled wastrel Lady Isabel Townsend has too many secrets and too little money. Though she is used to taking care of herself quite handily, her father’s recent passing has left Isabel at sea and in need of outside help to pretect her young brother’s birthright. the sinfully handsome, eminently eligible Lord Nicholas could be the very salvation she seeks. But the lady must be wary and not do anything reckless and foolish….like falling madly, passionately in love. 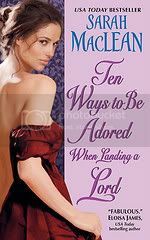 Ten Ways to be Adored when Landing a Lord is the second adult romance written by Sarah MacLean – one of my new favorite authors. For the purposes of this review we’ll shorten it’s lengthy name to “Ten Ways”. Lord Nicholas St. John is the younger twin brother to Gabriel St. John, the Marquess of Ralston whome we met in Nine Rules (to Break when Romancing a Rake). The most popular Ladies magazine in London has published an article called “Lessons in Landing a Lord” and has named Lord Nicholas as “London’s Lord to Land”. Although Nicholas had always attracted a fair amount of attention, he is now the subject of fierce pursuit. After fending off several aggressive young ladies, he decides to take a friend up on an assignment and leave London for a while. His assignment is to track down the missing sister of his friend, the Duke of Leighton. Leighton has funded Nick’s jaunts in search of antiquities in the past, and is aware of his “bulan” or tracker capabilities. His arrival in Duscroft, Yorkshire corresponds to Lady Isabel Townsend’s decision to sell her “marbles” or statue collection in order to bring much needed money into the house. She is actually on her way into town to post a letter requesting an antiquities expert come and evaluate her collection for sale when Lord Nicholas saves her from an out of control wagon. Pickly as always, instead of thanking Lord Nicholas for saving her life, she yells at him for crushing her into the ground during that save! When she realizes who he is, she invites him to Townsend Park the following day to begin his evaluation. Since Nick is as contrary as Isabel, he and his friend Rock (also known as Durukhan), show up that afternoon, they find Isabel in breeches on the roof trying to repair the areas that are leaking. He becomes increasingly suspicious the more that Isabel tries to hide things from him. The battle of these two stubborn people begin! I found Ten Ways to be just as delightful a book as Nine Rules was. The characters were just as compelling, but different in so many ways. I found this story to be more evocative. I was reaching for the tissues more often. I loved how strong Lady Isabel was. She weathered so much and continued to keep it together for the women she was protecting and for her brother’s inheritance. It really brought home how vulnerable women were in that time period. Their lack of rights makes me thankful for the freedoms I have! This book sizzled with the chemistry between Nick and Isobel, and simmered with the gentle attraction between Lara and Rock. This book was also funny as only Sarah MacLean can make it. The opening scene of the book has a man – Mr. Asperton – showing up at Townsend Park to collect his bride – Lady Isabel. It seems that he won Lady Isabel in a card game with her father. The butler, stable master and cook (all women disguised as men) are standing in the front hall to greet him after he has been turned down by Lady Isabel. The stable master (Kate) is slapping her coiled horse whip against her thigh. The cook (Gwen) is swinging a heavy rolling pin and the butler (Jane) is casually inspecting the sharp edge of a sabre. The sight of Kate with her horse whip gives Mr. Asperton concern, but the sabre striking the ground has him mounting his horse and leaving the property in a hurry! A thoroughly enjoyable read that has me eagerly anticipating the next story in the series! I’ve had my eye on this author for awhile. Man seriously want to read this soon but my TBR pile is out of control…lol. Wonderful review as always! I hear you! 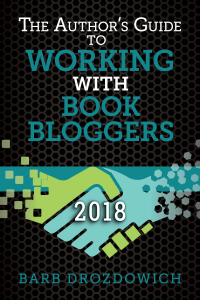 I just read 11 Scandals the other week, regardless of the toppling TBR pile so that I could finish the series, only to find out that there is another one coming! My husband says that my TBR pile needs it’s own room it’s so big. I thought I could get it under control by the end of the year but I don’t know…..thanks for stopping by!